Have You Seen The Kaluve Residence? 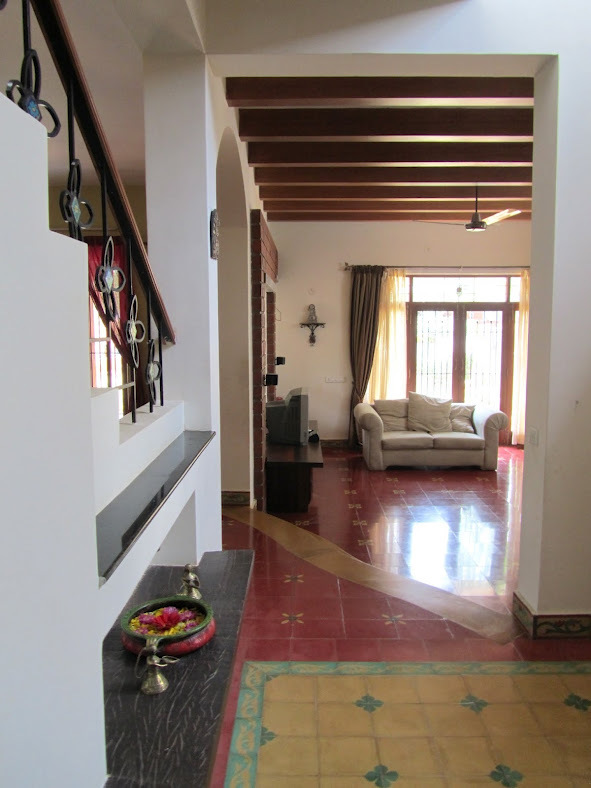 This magnificent 3,300 sq.ft bungalow in Classic Orchards, off Bannerghetta Road in Bangalore is home to Seetha and Shyam Kaluve. Designed and built by architects at Tabula Rasa, it’s a feast to the eyes. 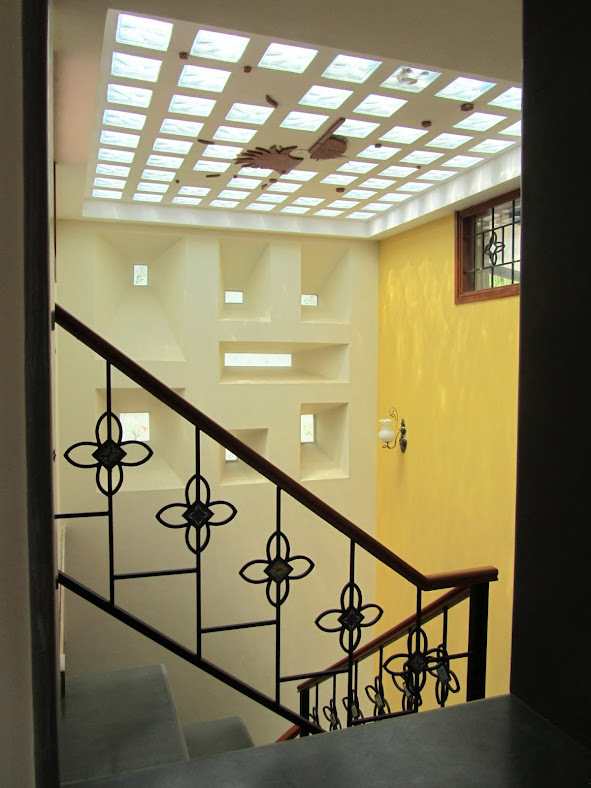 The palatial bungalow boasts of enviable architectural features, further accentuated by materials used in yester year homes. The beautiful exposed brick wall is the first thing you see when you enter the house. Modern comforts are far and few in the living room. 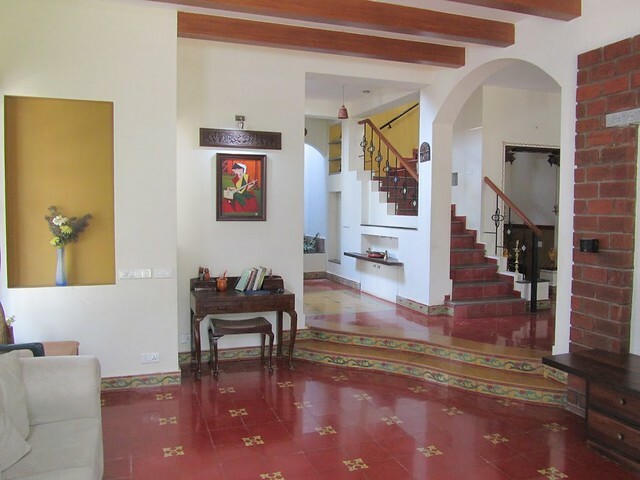 There is an inordinate amount of thought and detail that has gone into in replicating elements of olden day homes such as cement slabs for seating, the Athangudi tiles used for flooring, wooden rafters to keep the house cool in summers, Jaipur blue tile inserts in the staircase railing,and natural lighting from terrace. These are also eco-friendly choices that add to visual delight. 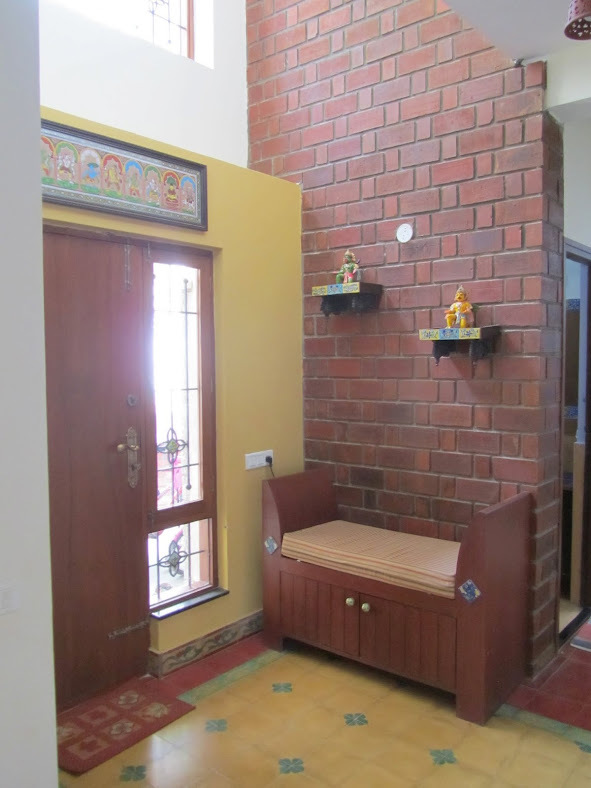 Wooden pillars, oonjal were commonplace in homes 40-50 years ago. 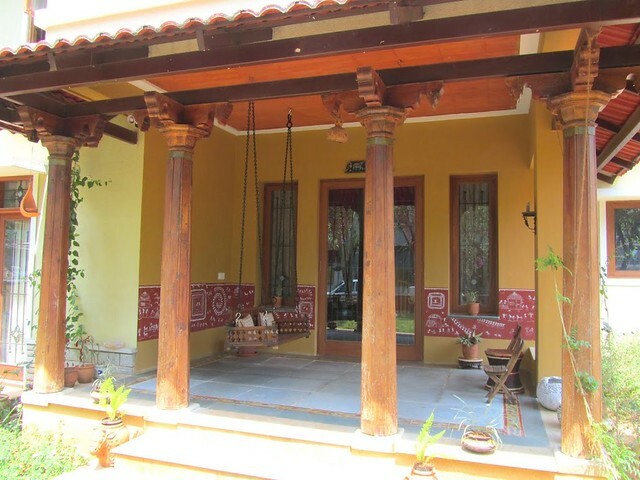 The home also flaunts a front porch supported by four wooden pillars. 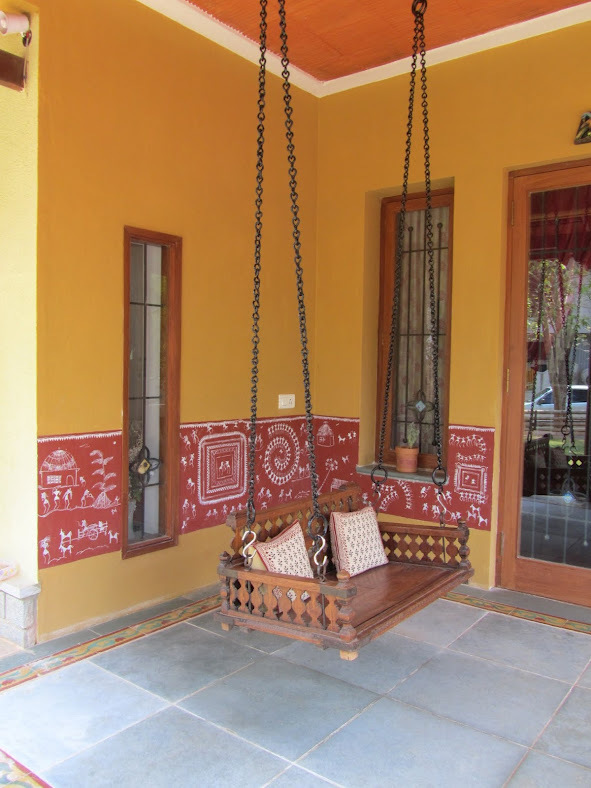 Known as thinnai or veranda, this space sported a cement bench for folks to sit and gossip in the evenings. Don’t you love the wall niches? Small wall niches served many purposes. There were two niches at the entrance of the house where oil lamps were lit every evening. In other such niches around the house, other useful things such as hurricane lamps were kept. Remember we are talking about a period where woodwork was not decorative in purpose, but limited to almirahs for keeping good clothes and valuables. I’ve seen the daily wear clothes often hung on a clothes line high above the store room (as pantry was known then), close to the kitchen. In short, this home is a tribute to the golden years and the way of life then. Can the same design aesthetics be incorporated in an apartment? Sure, check Ramya and Anand’s apartment. Bet you’ll love it. I really loved the post…The front look of the house is just amazing. One not such a big budget myself, can you suggest me something similar for an apartment. Some architect who would do similar thing, but based in Gurgaon? It would be really helpful. 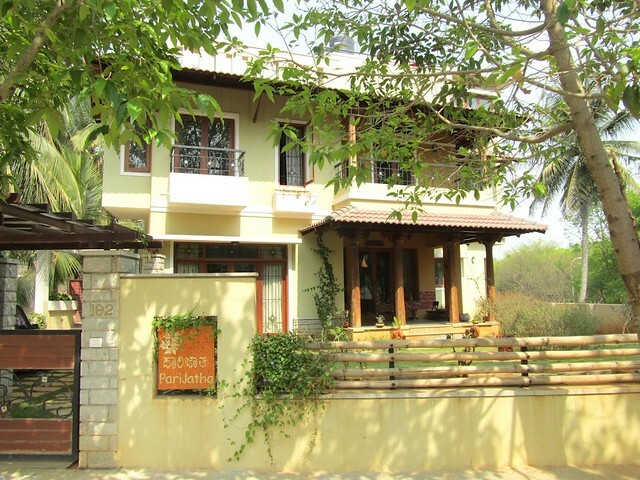 Hi Lakshmi, can you please suggest architects based in Bangalore? I’ve seen houses built by Cadence and liked their execution. You may want to check them out. Similarly, saw one built by Jaisim of Fountainhead too at Whitefield.